You may confused with mux demux or multiplexer products and todoy we will figure them out. Mux, is an abbreviation for multiplexing or multiplexer, refers to the process of combining two or more inputs into a single, aggregate signal transported via a single transmission channel, or a device that performs the process. Demux, on the other hand, is an abbreviation for demultiplexing or demultiplexer, and refers to the separation of two or more previously multiplexed channels into their component parts, or a device does so. The job of a “multiplexer” is to allow multiple signals to share a single common output. For example, a single 8-channel multiplexer would connect one of its eight inputs to the single data output. Multiplexers are used as one method of reducing the number of logic gates required in a circuit or when a single data line is required to carry two or more different digital signals. On the opposite, the demultiplexer takes one single input data line and then switches it to any one of a number of individual output lines one at a time. The demultiplexer converts a serial data signal at the input to a parallel data at its output lines. Often a multiplexer and a demultiplexer are combined into a single device allowing the device to process both incoming and outgoing signals. Alternately, a multiplexer’s single output may be connected to a demultiplexer’s single input over a single channel. Either method is often used as a cost-saving measure. Since most communication systems transmit in both directions, the single combined device, or two separate devices, will be needed at both ends of the transmission line. The multiplexer is a very useful combinational device that has its uses in many different applications such as signal routing, data communications and data bus control. When used with a demultiplexer, parallel data can be transmitted in serial form via a single data link such as a fibre optic cable or telephone line. They can also be used to switch either analogue, digital or video signals, with the switching current in analogue power circuits limited to below 10mA to 20mA per channel in order to reduce heat dissipation. To manage bandwidth and expand capacity of existing fiber optic backbones, Wavelength Division Multiplexing (WDM) works by simultaneously combining and transmitting multiple signals at different wavelengths in the same fiber. The common configuration of CWDM mux/demux module is 2CH, 4CH, 8CH, 16CH, 18CH CWDM mux/demux module. 3 single fibers or dual fiber connection for CWDM Mux/demux are available. 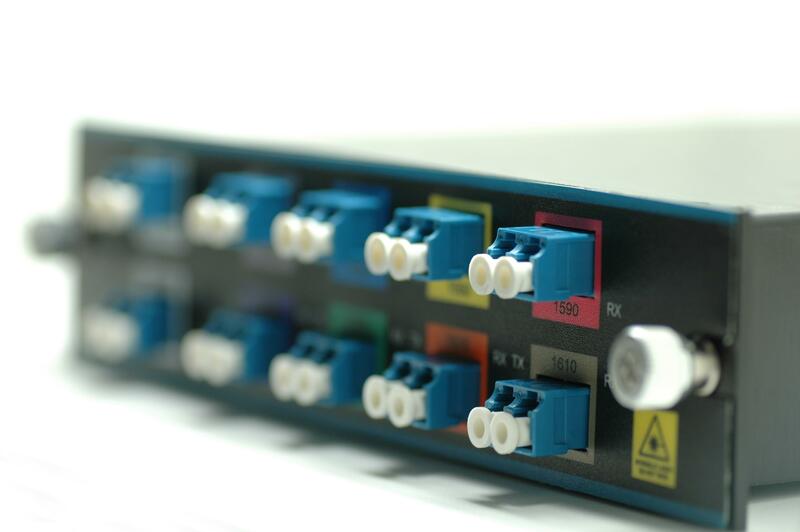 As for DWDM mux/demux, the common configuration is 2CH, 4CH, 8CH, 16 CH, 32CH, 40CH channels. FiberStore provides a wide selection of mux demux OADM products to meet various channel count and spacing requirements. They also offers all types of fiber optic cables, want to learn more about bare fiber, click it.